(Central Islip, N.Y., March 29, 2018) – The Long Island Ducks today announced the signings of right-handed pitcher Vinnie Pestano and left-hander Wander Perez. 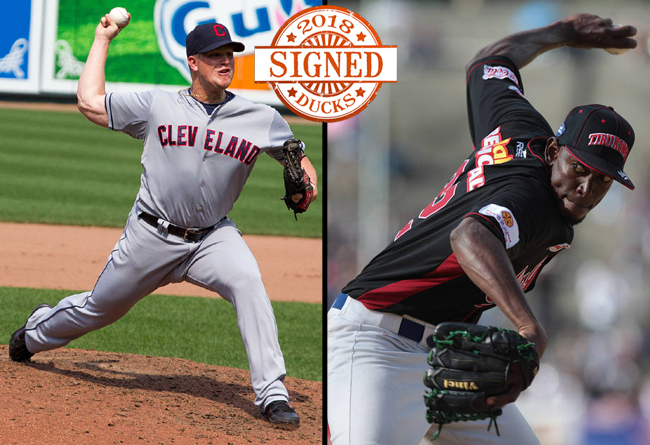 Both players will begin their first season with the Ducks after their rights were acquired in the Bridgeport Bluefish Player Dispersal Draft last November. Pestano joins the Ducks with six seasons of Major League experience, making 223 relief appearances with the Cleveland Indians and Los Angeles Angels from 2010 to 2015. He compiled a sparkling 2.98 ERA with 11 saves and 244 strikeouts over 202 and two-thirds innings. The California native pitched a scoreless ninth inning against the Kansas City Royals in his MLB debut on September 23, 2010. Pestano also set an Indians single-season record with 36 holds in 2012, a mark that has not been met since. The 33-year-old spent the 2017 season in the Atlantic League with the Bridgeport Bluefish. He accumulated a 3.25 ERA in 26 appearances and struck out 30 batters while walking just five. Previously, the 11-year pro represented Team USA at the 2013 World Baseball Classic, appearing in three games. He was also named a Mid-Season All-Star at both the Single-A and Double-A levels in 2008 and 2009, respectively. After stints with the Indians and Angels organizations, he pitched in the New York Yankees organization in 2016 with Triple-A Scranton/Wilkes-Barre. The California State University Fullerton alum was originally drafted by the Indians in the 20th round of the 2006 amateur draft. Perez comes to Long Island with nine seasons of professional experience, including stints in the Chicago White Sox and Philadelphia Phillies organizations. He began 2017 at the Triple-A level with the Phillies, appearing in six games with Lehigh Valley. The Dominican Republic native spent the first four seasons of his career in the White Sox system, appearing 129 games (three starts) and reaching as high as Advanced-A. The 33-year-old pitched in the Atlantic League with the Bridgeport Bluefish in parts of two years (2015, 2017). In six games during the 2015 campaign, he twirled five and two-thirds scoreless innings, yielding just three hits and two walks. This past season, the southpaw turned in a miniscule 1.71 ERA over 21 innings, allowing just 14 hits and five walks while striking out 25. Perez was originally signed by the White Sox as an undrafted free agent in 2006.